From the tascas of Madrid to the tapa bars of Málaga, gambas al ajillo—sizzling, garlicky shrimp—is a favorite tapa (known as gambas al pil pil in Málaga). 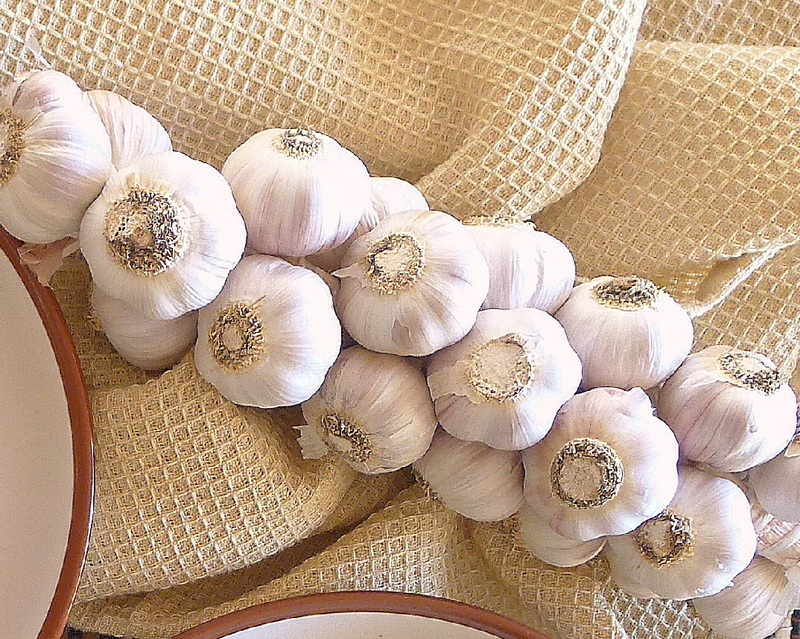 That’s because it’s a real sensory experience: first you catch a tantalizing whiff of garlic. As the lid is lifted from the little clay dish, the oil spits and splutters. 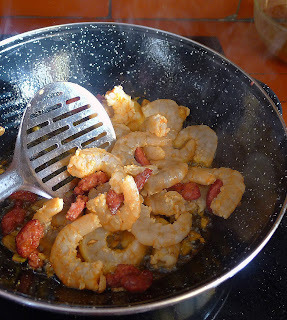 Small pink shrimp, golden slices of garlic and red flecks of chile dance in the oil. Dip chunks of bread into the sizzling juices and fork up the tender shrimp. Wow. 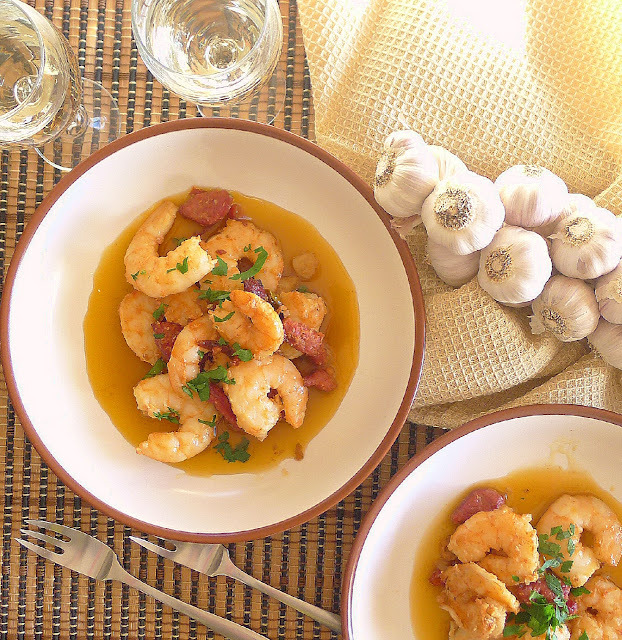 Because it’s a classic, I included Sizzling Garlic Shrimp on the tapas menu for a cooking class I had last week in my kitchen. But, after the meatballs and tortilla, boquerones and orange salad, plus a lot of chatter, we never got to the shrimp. So, the following day, I cooked the shrimp that I had prepped for the class for myself. But I pretty much reinvented the classic. 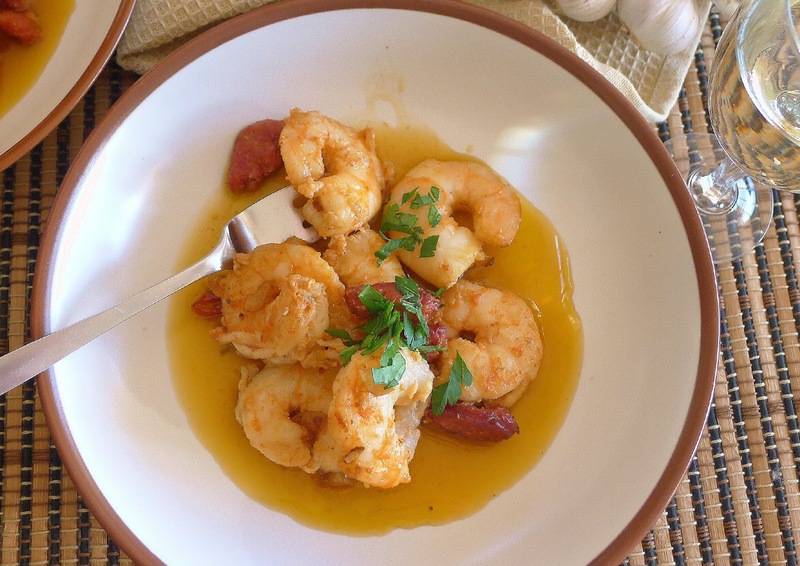 A few changes on classic gambas al ajillo (sizzling shrimp)--pieces of chorizo and a slosh of fino Sherry go into the bubbling oil. I had already begun the variations on the traditional recipe. For convenience, I bought frozen langostinos*—jumbo shrimp—instead of fresh gambas—small to medium shrimp that are usually used for this dish. And, now that I have an induction cooktop, I can no longer use the little earthenware cazuelitas. So I cooked all of the shrimp in a deep skillet, instead of in individual servings. Some leftover soft chorizo and an open bottle of fino manzanilla (Sherry from Sanlucar de la Barrameda) inspired more changes. And, because I think green leafy vegetables improve just about anything, I added a handful of chopped spinach. First I served the shrimp, sort of like the original tapa, with chunks of bread to sop up the savory juices. 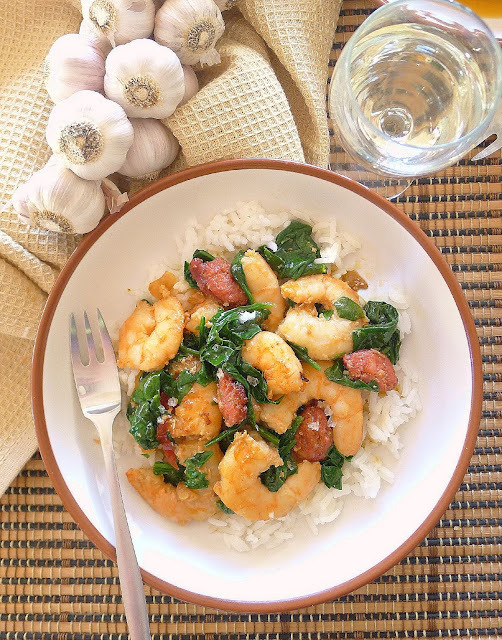 For another meal, I served the shrimp, chorizo and spinach with all their spicy juices over cooked rice. Jumbo shrimp in olive oil with chorizo and bits of hot chile. You'll need chunks of bread to soak up the savory juices. A tapa becomes a meal--the sautéed shrimp with garlic and chorizo plus spinach, served over rice. 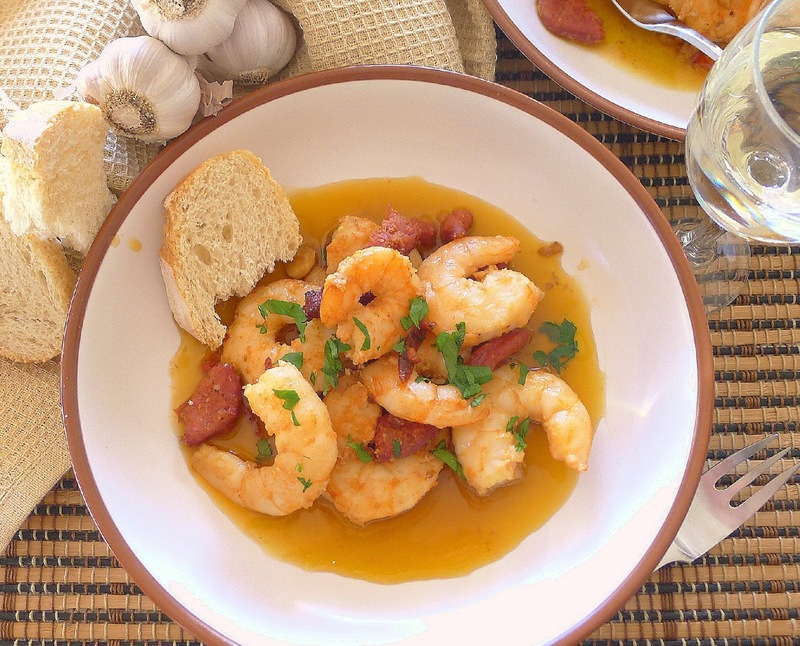 Fino (dry) manzanilla or Sherry is the perfect wine pairing for the shrimp. As a tapa, I had portioned four jumbo shrimp per person. So I had 20 peeled shrimp weighing 13 ounces. That made three good-sized servings (main dish with rice) or four smaller servings as a starter. 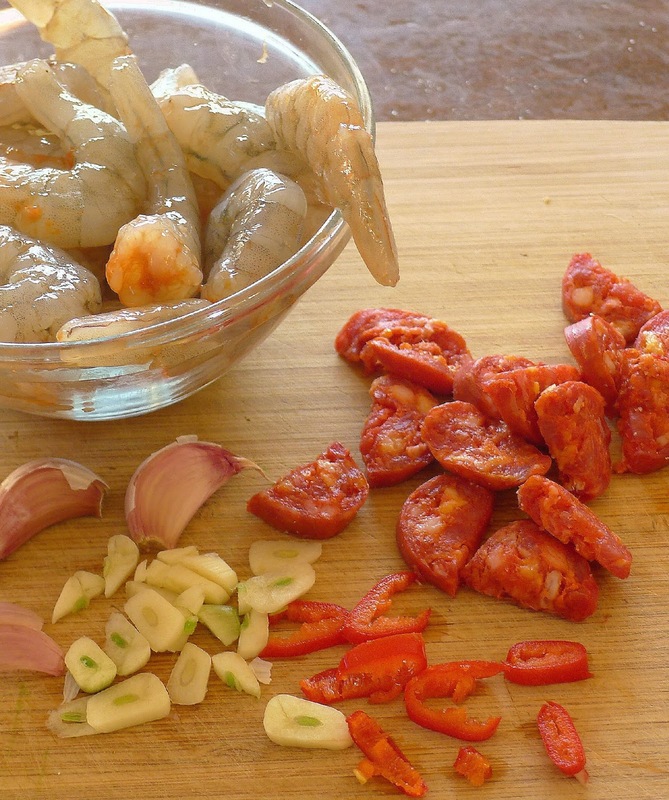 Incidentally, the shrimp for this dish are peeled--including the tails. I used soft cooking chorizo** but sliced, hard-cured chorizo could be used too. 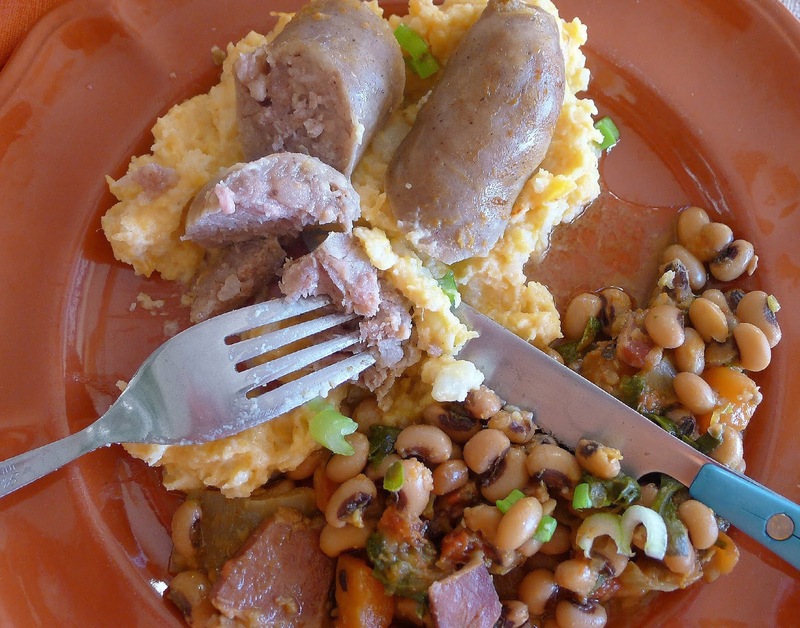 And, I bet leafy chard or kale would be as good as spinach in this dish. Heat the oil on medium-high in a deep frying pan. Add the garlic, chile and chorizo. When the garlic begins to turn pale gold (1-2 minutes), add the shrimp and spinach. Sauté, turning the shrimp, until it turns pink, 2-3 minutes. Add the Sherry and cook until the alcohol is cooked off, 2 minutes. Season with salt. Serve the shrimp immediately, spooned over hot rice, if desired. Garnish with chopped parsley. 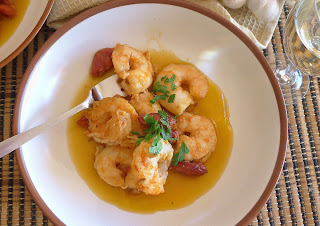 Sizzling Shrimp (classic al ajillo). Tofu and Mushroom Sauté with Garlic. 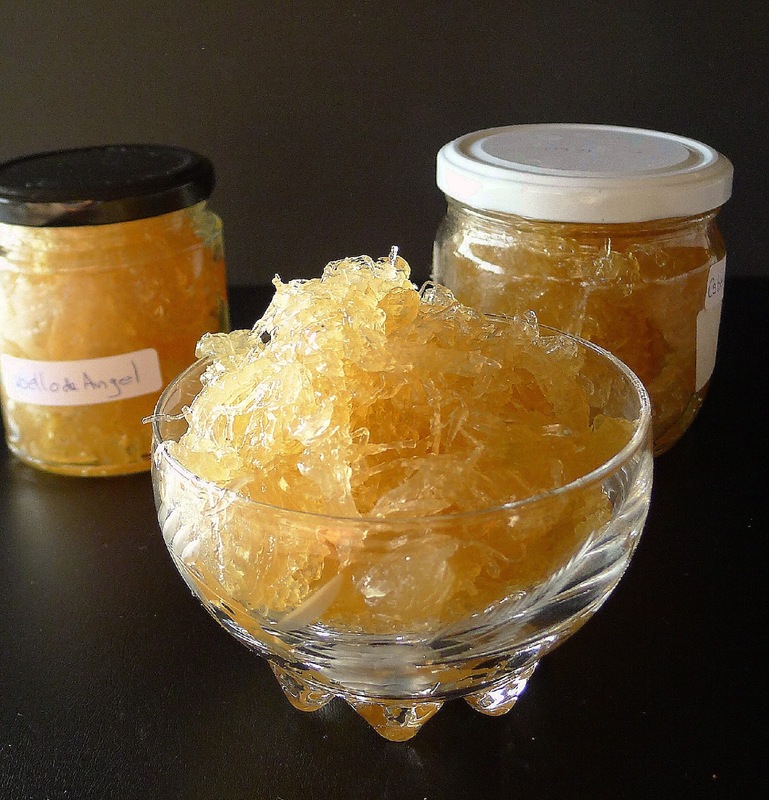 Golden angel's hair, an unusual marmalade. This pot of gold comes from an unusual squash called cidra. Cidra is the Malabar gourd, Cucurbita ficifolia, or “fig-leaf” gourd. 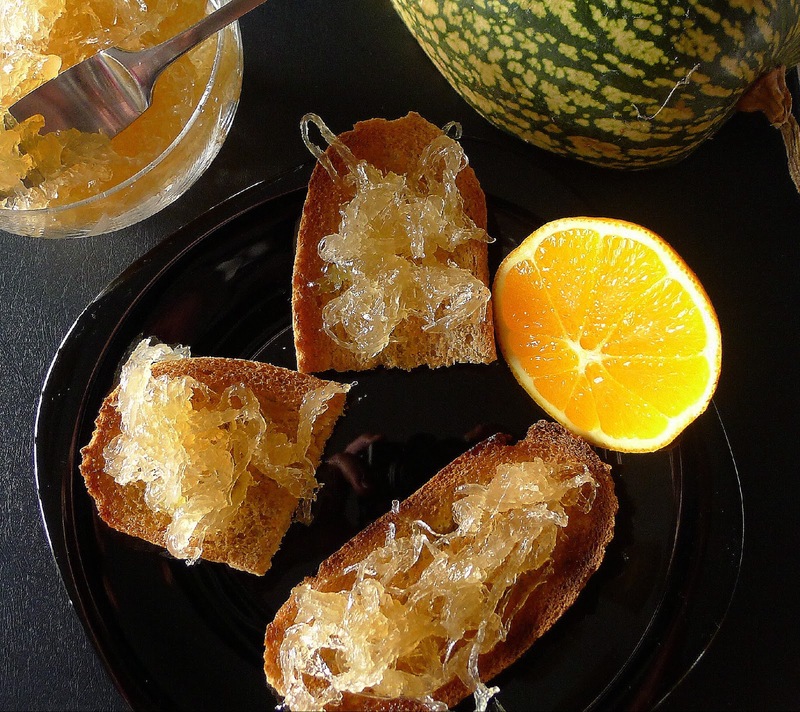 In Spain it seems to be grown for only one purpose—the confection of cabello de angel, “angel’s hair,” a golden confiture of candied strands of the squash. 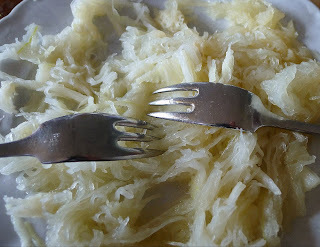 Angel’s hair is used as a filling in many traditional pastries. 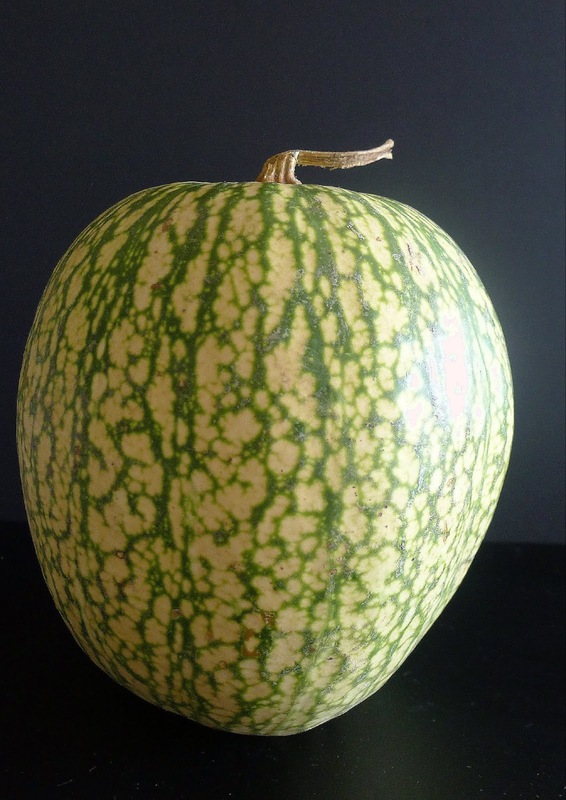 Cidra is a type of squash. The flesh is candied to make a filling for typical Spanish pastries. 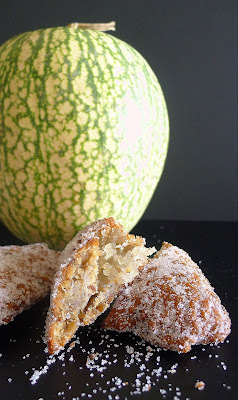 These empanadillas are filled with cabello de angel, angel's hair made of candied squash. Now that I’ve actually made angel’s hair, I can divulge the secrets of cidra. It indeed has a tough hide, like leather. This is probably why it has an extremely long “shelf life.” I was able to pierce it with a knife and prise it open. But, hey, if dropping it on the floor works, go for it. 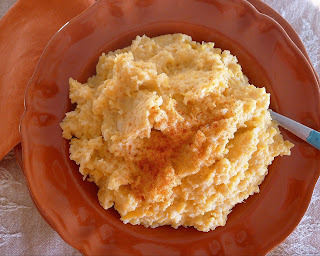 Traditional recipes for cidra call for cooking the squash in a pot of water for up to an hour. Perhaps the microwave would work—as it does beautifully for spaghetti squash? Yes! The cidra needed only 12 minutes to become tender enough to shred. But, no, cidra is not the same as spaghetti squash, which is a cultivar of Cucurbita pepo. (I still can’t say if spaghetti squash would work in the confection of angel’s hair. I intended to settle the issue, but my home-grown spaghetti squash turned out to be a butternut mutant and did not separate into strands.) 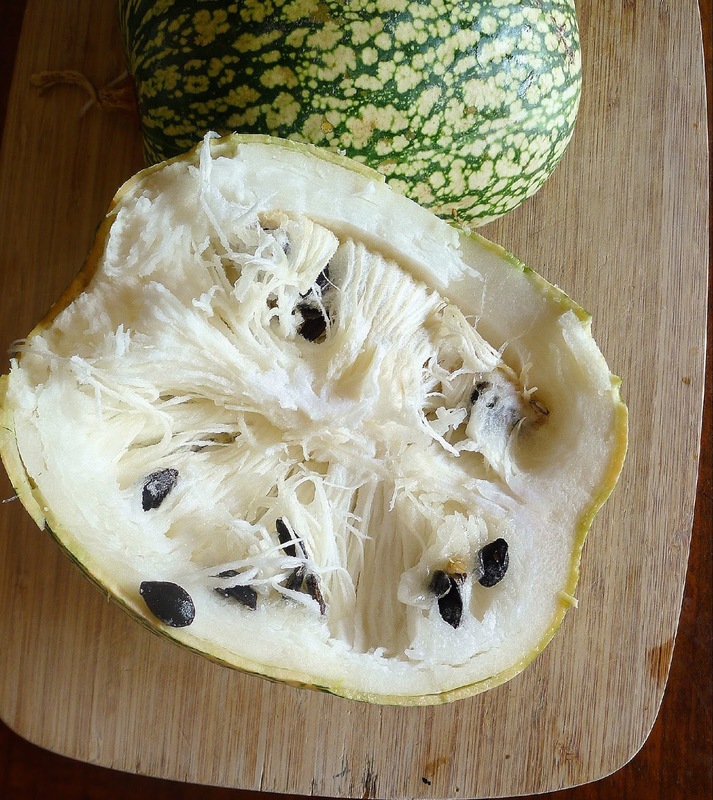 And, although the name "cidra" is also used in South America to designate the chayote (see last week’s blog for a photo of that green cucurbita), the Malabar gourd is different from chayote. The threads of squash pulp cook with lots of sugar, lemon zest and cinnamon. Sauteed al ajillo (with garlic). I can tell you that cidra is the most tasteless food I have ever tried! 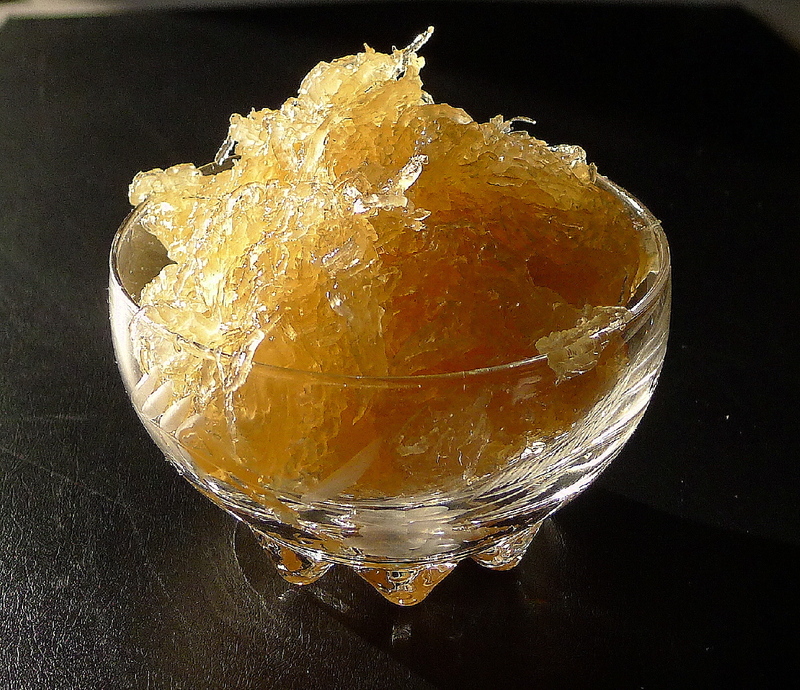 No wonder it has to be candied with a huge quantity of sugar. 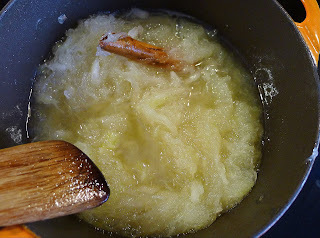 I experimented with the cooked cidra in a savory dish, sauteeing it in olive oil with sliced garlic, al ajillo. Meh. Old recipes for angel’s hair call for an equal weight of the pulp and sugar. I decreased the sugar, using 75 percent of the weight of the pulp. In the traditional kitchen, the angel’s hair is preserved in jars for use all year long. If you intend to do this, use the full weight of sugar. 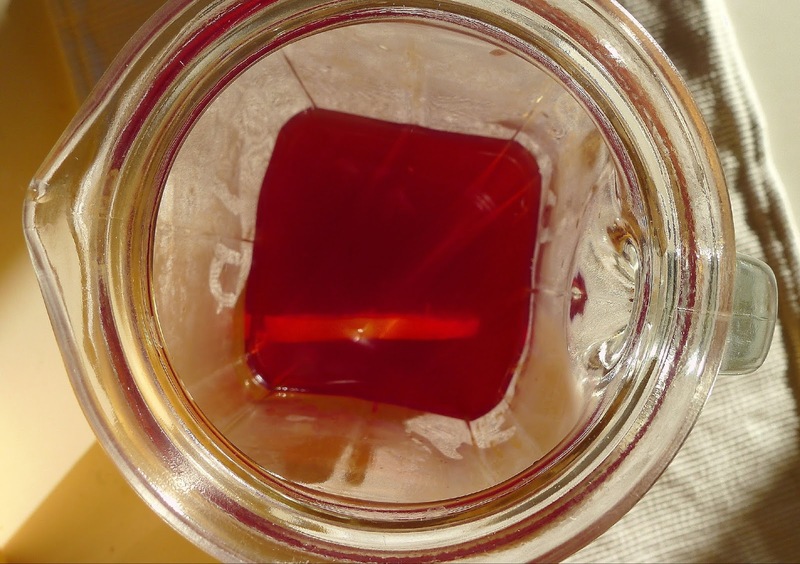 Place the hot confiture in sterile jars and process them in a boiling water bath. Or, freeze it. Like marmalade, angel's hair is good on breakfast toast. What am I going to use the angel’s hair for? I’m trying to decide between several pastries. Meanwhile, the kids used it like marmalade, as a topping for breakfast toast. They think it would be good on a peanut butter sandwich. I’m thinking it would be nice with mild queso fresco, fresh white goat’s cheese. Cinnamon and lemon zest are the traditional additions to this confiture. 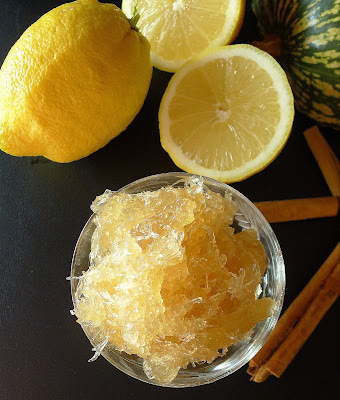 If you like candied lemon peel, you might prefer to shred the lemon zest finely and mix with the strands of squash rather than remove the strip of zest after cooking. After cooking and draining the squash pulp, weigh it. Use ¾ of the weight in sugar. I had 670 grams of pulp; 75 percent of that weight was 500 grams of sugar. 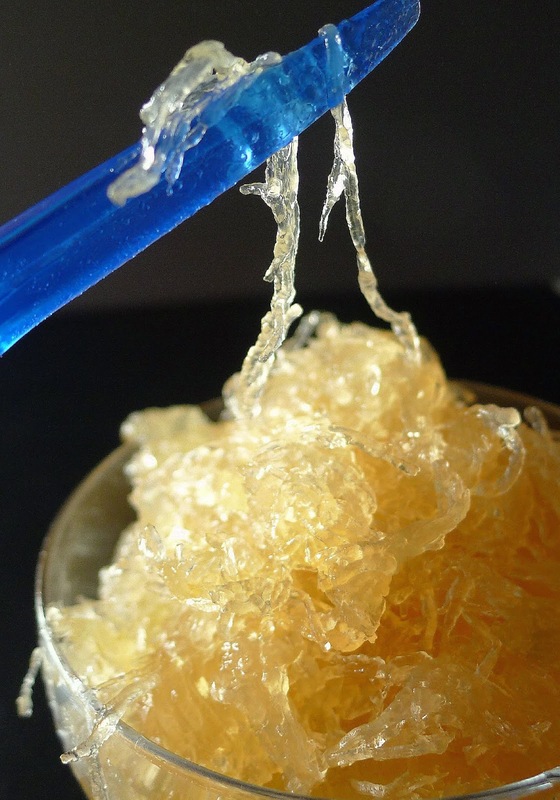 Measured by volume, it was 2½ cups of squash and 2 ½ cups of sugar. Before cooking, the flesh of the cidra is very white, stringy around the seeds, solid inside the skin. Seeds are mainly black, but little transparent ones run through the stringy bits of flesh. After cooking, the rim of flesh inside the skin will separate into strands. Wash the squash and split it open. Divide in halves or quarters. Remove as many seeds as possible. Place the squash, cut side down, on a plate and cover with a microwave-safe vented lid. Microwave on high for 6 minutes. Leave the squash in the microwave for 5 minutes. Turn it cut side up. Cover and microwave for 6 minutes. Leave it 5 minutes before opening. Use forks or fingers to separate the flesh from the shell. Separate the flesh into strands. When the squash is cool enough to handle, scoop the flesh out of the shell. Use a fork to separate it into strands, discarding any remaining seeds. Cut away the knob of flesh at the stem end. Place the shredded squash in a colander and let it drain for 60 minutes. Weigh the pulp. Use ¾ the weight of sugar. Place the squash and sugar in a heavy pot with the cinnamon stick and lemon zest. Add the lemon juice. 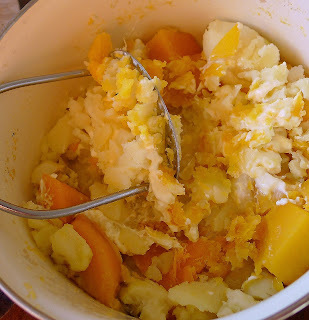 Stir to combine sugar and squash strands. Allow to sit 30 minutes. The pulp of the squash cooks with sugar, cinnamon and lemon zest until thickened into marmalade. In this photo, the mixture has just begun to cook. Parsnips and other lumpen vegetables. Clockwise from top left, chayote, rutabaga, spaghetti squash, kohlrabi and parsnips. I have a thing about parsnips. I used to pack them in my luggage when returning from a trip to the U.S. That was before they turned up in local markets. 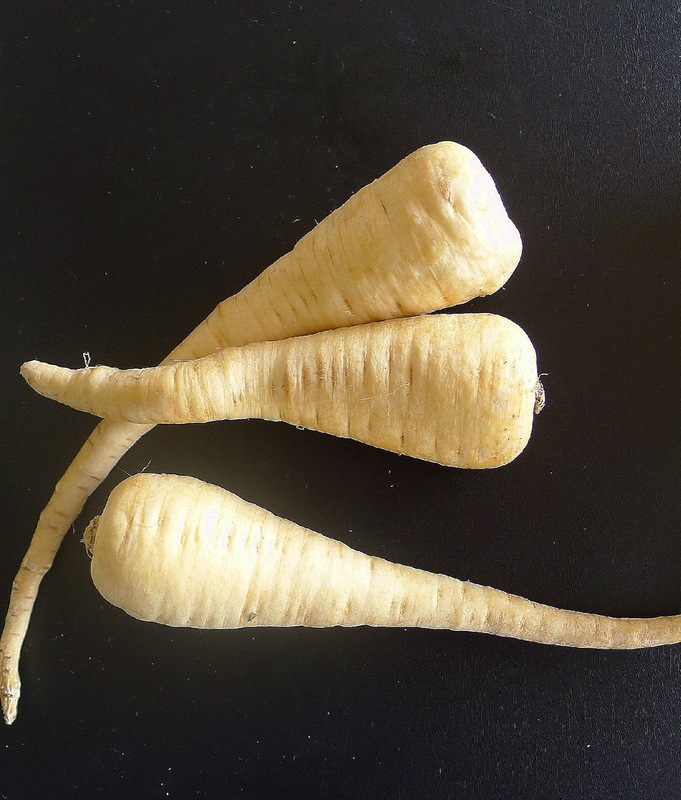 I love parsnips pan-roasted alongside a chicken or mashed with olive oil. I also quite like other knobbly, gnarly, lumpen vegetables such as rutabaga, kohlrabi, celeriac and chayote. Except for chayote, none of these uglies were grown in southern Spain. Now, the European common market brings all sorts of “exotic” produce even to my small village. Except for their lumpy shapes, these vegetables are not related. However, they are all good either raw or cooked. They all somewhat resemble potatoes—although with a much lower carb count. They all are improved with lashings of olive oil or butter, bacon or cream. 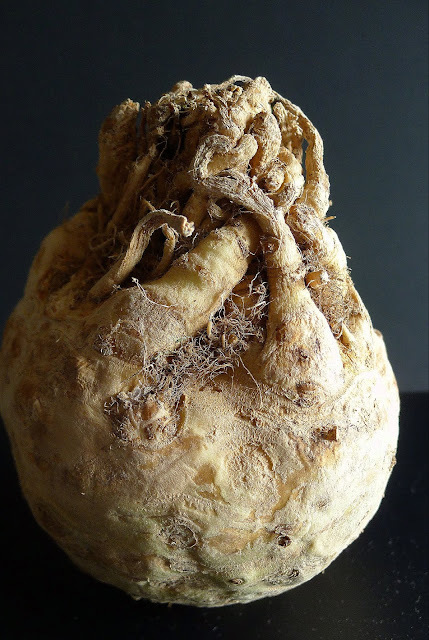 Celeriac or celery root (apio-nabo) is the beauty of the bunch. This vegetable (Apium graveolens) has a pronounced celery flavour, but without the stringy fibres of celery stalks. It's crisp and crunchy when raw (shredded with remoulade sauce for a classic French bistro salad) or wonderfully smooth and creamy when pureed, as in celery root soup. I love it diced in any vegetable soup. 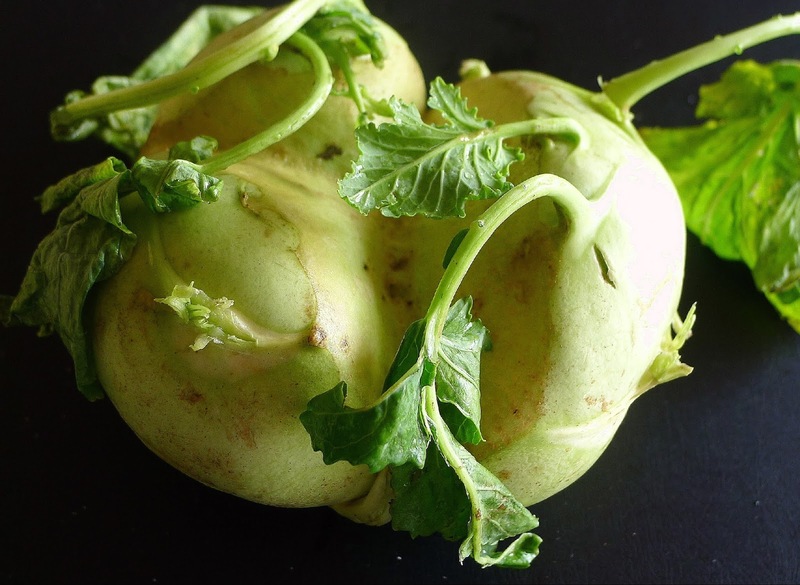 Kohlrabi (Brassica oleracea). In Spanish, this is colinabo. But, so little is it known in Spain that the nomenclature is often confused with that of the rutabaga. Kohlrabi is a cultivar of wild cabbage. In spite of its appearance, it is not a root, but the thickened stem of a "broccoli" plant (sort of). I like it, thinly sliced, in stir-fry dishes, a crisp substitute for water chestnuts. 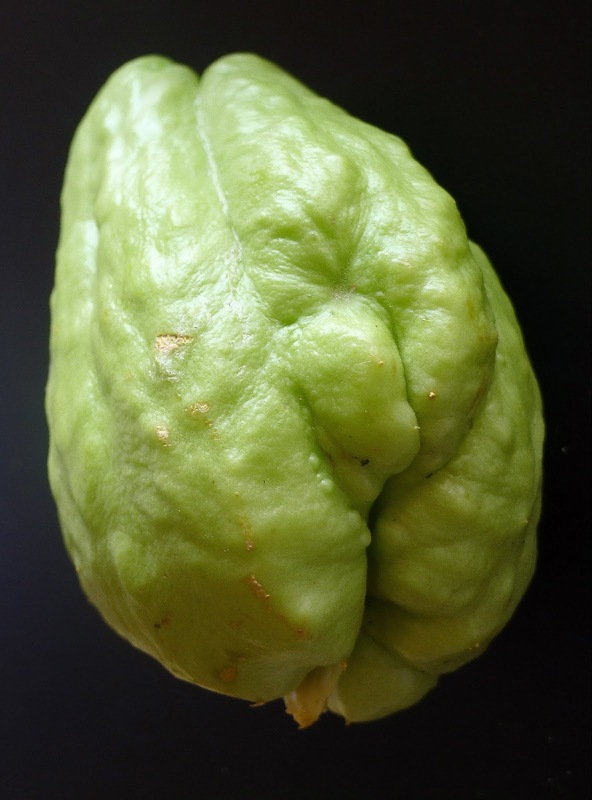 Chayote (Sechium edule) is a member of the cucurbitacea family that includes cucumbers, squash and melon. In Spanish markets I knew it as papa del moro, or "Moorish potato," a misleading name, as the vegetable was unknown in Spain in Moorish times. It comes from the New World. It's also know as patata voladora, or "flying potato," as it swings from climbing vines. It has a remarkable similarity to potatoes (but is very low carb). 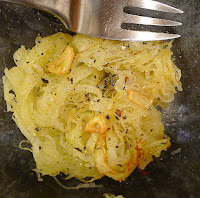 I used it in a gratin dish with cheese and, grated with potato, for latkes (potato pancakes) made with chickpea flour and Indian spices. Rutabaga (Brassica napobrassica) looks like a giant turnip. It's actually a cross between the turnip and cabbage families. The name comes from the Swedish word for "lumpy root." 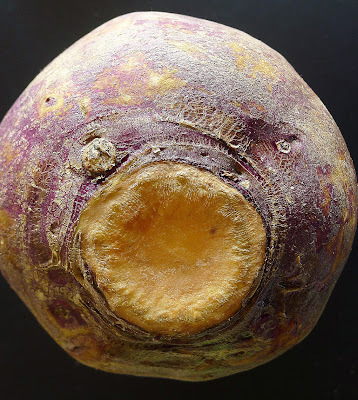 Rutabaga is also known as "Swede" and "neep." In Spanish it is nabo sueco. 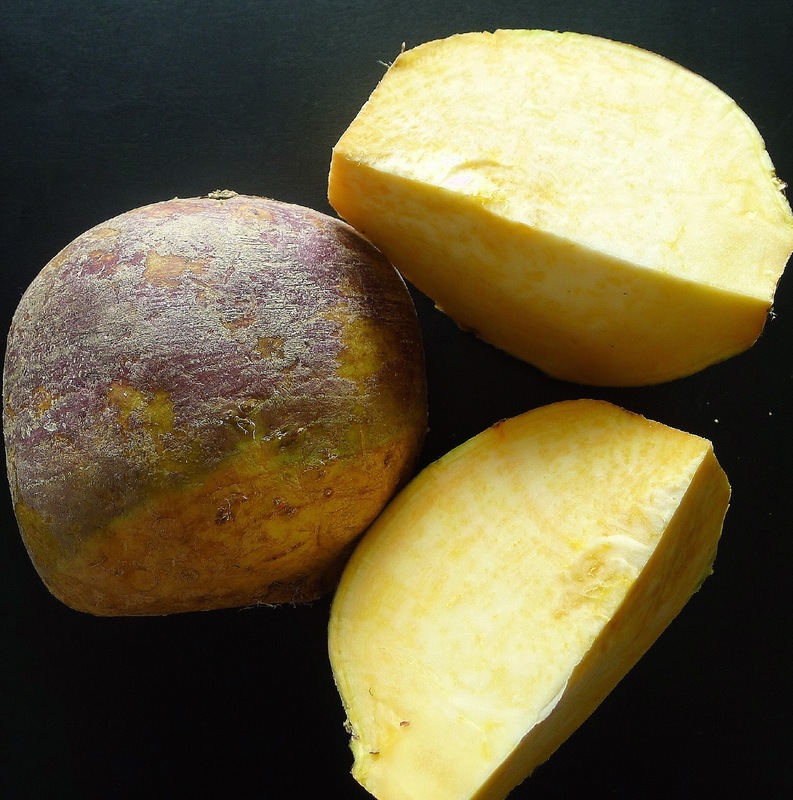 Rutabaga is a good substitute for potatoes (or, thanks to its yellow color, for sweet potatoes). It's milder than turnips in flavour, earthy and slightly sweet. Parsnips (Pastinaca sativa) are related to carrots (chirivìas in Spanish). They are decidedly sweet, delicious roasted or pureed. 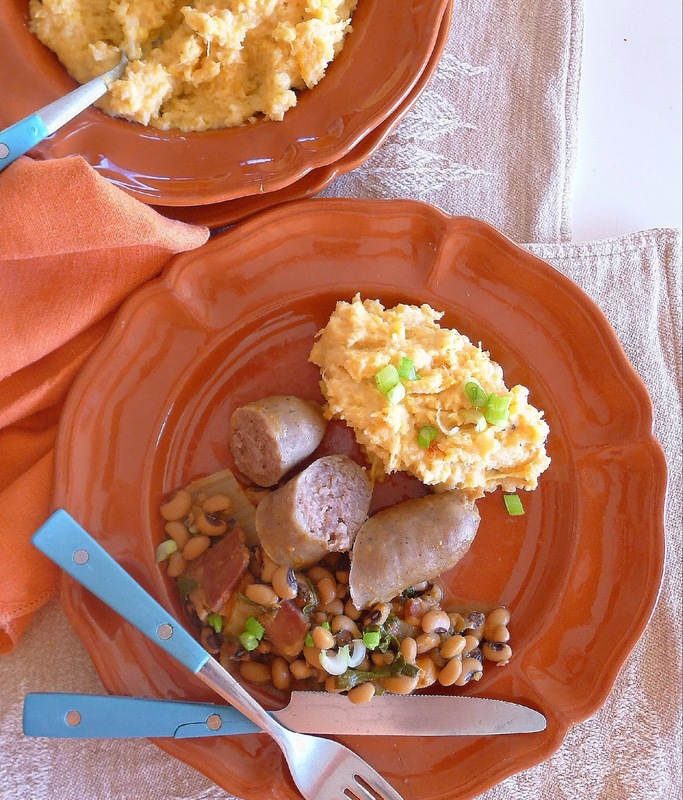 Rutabaga mashed with potatoes and garlic makes a fine side dish with sausages and black-eyed peas. 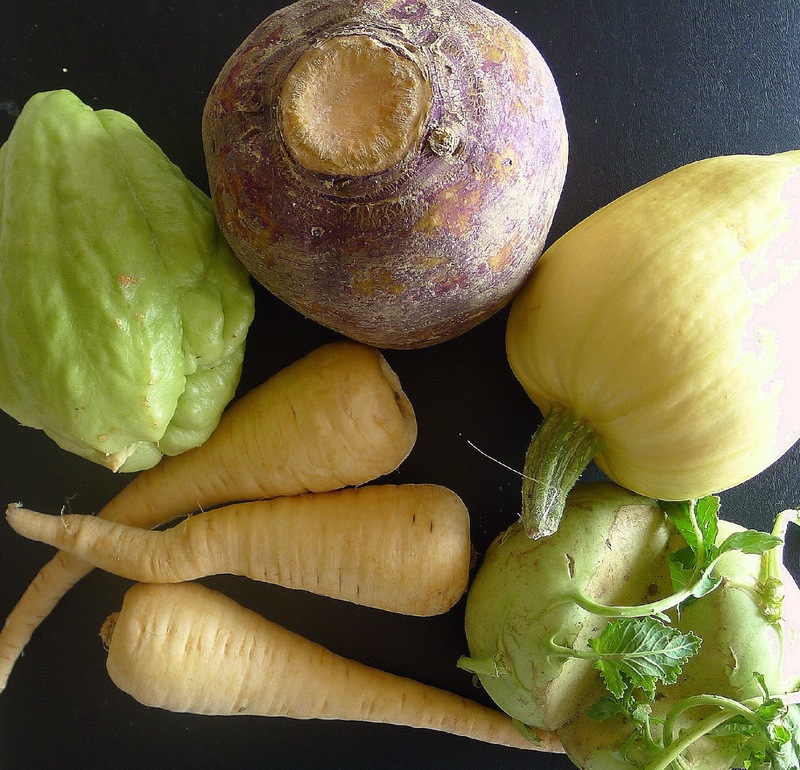 In this recipe you could use any of the featured vegetables in place of rutabaga—parsnips, chayote, kohlrabi or celeriac. If a whole head of garlic seems excessive, use just two cloves, cooked and mashed with the vegetables. 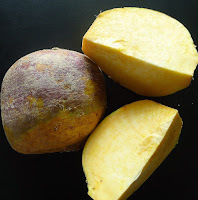 Rutabaga needs long cooking to render it soft enough to mash, so start it before the potatoes. Peel the rutabaga and cut in 1 ½ -inch cubes. Peel potatoes and cut them in half. Slice the top off the head of garlic. Bring a large pot of salted water to a boil. Add the rutabaga and cook for 20 minutes. Add the potatoes and garlic to the pot and cook until they are tender when pierced with a skewer, 20 minutes. Drain the vegetables, reserving about ½ cup of the cooking liquid. Separate the head of garlic. Add the cream cheese and oil to the drained vegetables. Mash them with a potato masher or put through a ricer. Add enough of the reserved cooking liquid to make a smooth mixture. Squeeze the cloves of garlic out of their skins. 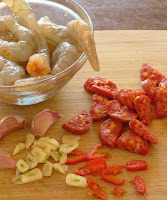 Mash them in a small bowl, then blend into the vegetables along with pimentón, salt and pepper. 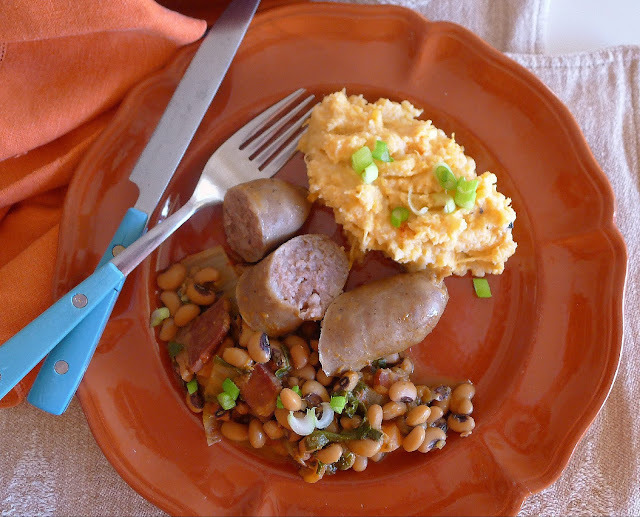 Serve immediately or place in a lightly oiled casserole and reheat in a medium oven. Mashed rutabaga and potatoes with chorizo criollo and black-eyed peas. Go ahead, mix it all together! Crushed Parsnips with Wild Boar. For a holiday lunch with guests who don’t drink alcoholic beverages, I concocted a festive punch of red hibiscus tea, spicy chai, sliced oranges and fizzy water. It was a drink with pop, without the punch. Hibiscus punch is bright, fruity and spicy. After the party, I had a cup or two of the bright and spicy drink leftover. I turned it into a sauce for duck breast by cooking it with sweet Sherry and thickening the sauce with cornstarch. I tried it with cream instead of cornstarch, too, but the cream turned the sauce from cherry-red to pink. I liked the red best. Leftover hibiscus punch is the basis of a spicy sauce for duck. 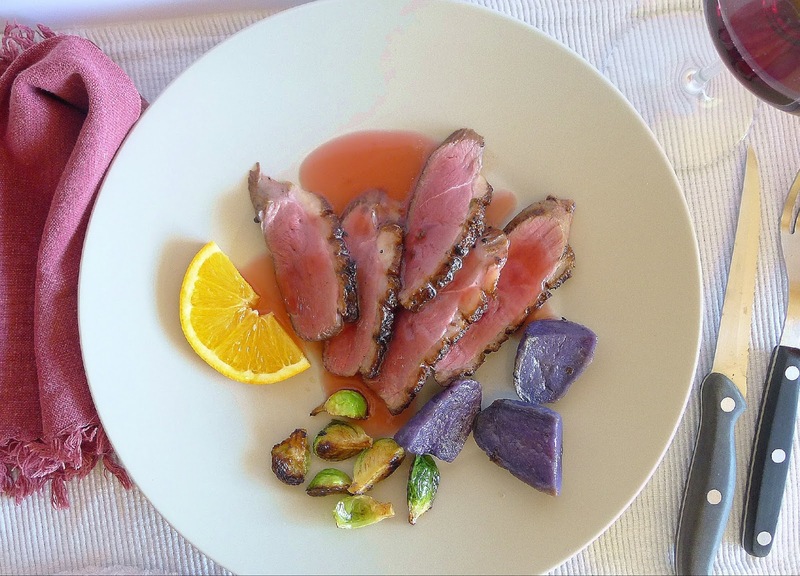 Sliced and sauced magret (duck breast) with purple potatoes and brussels sprouts that have been sautéed in the duck fat. This punch is best if not overly sweet. Use 2-3 tablespoons of sugar (or a few drops of non-caloric liquid sweetener such as stevia). Agua con gas (seltzer water) gives the drink fizz. Add it to the punch immediately before serving. Guests who prefer their punch with real punch can top-up with cava sparkling wine instead of soda. Or rum. Ice is optional. Tea bags for the punch. Hibiscus tea (or infusión) is made from flowers of the Hibiscus sabdariffa plant, also known as flor de Jamaica, malva and sorrel flowers . Apparently, it is not the same variety as the red hibiscus that blooms on my patio (Hibiscus syriacus or Hibiscus rosa-sinensis). 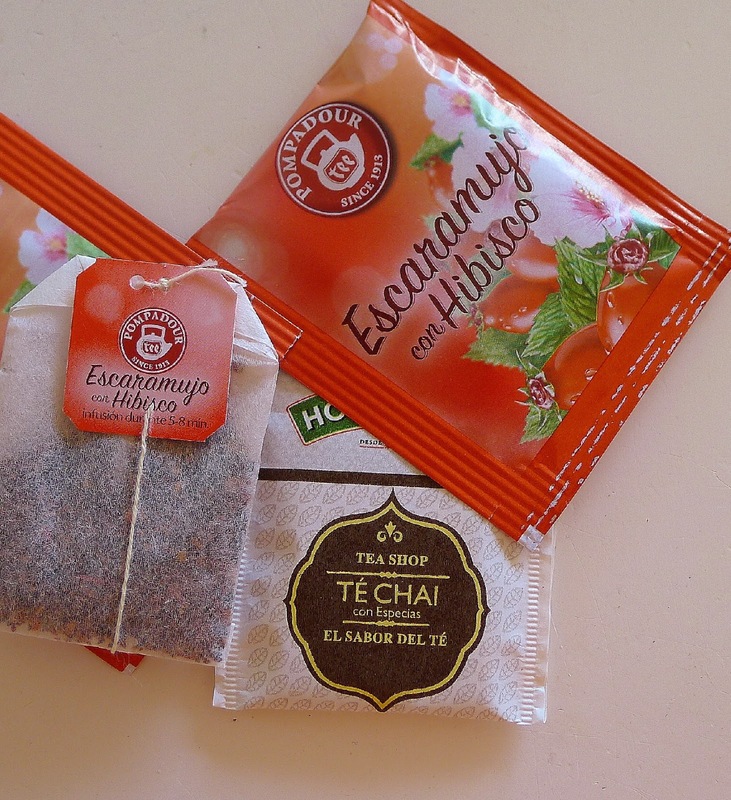 The tea bags I used contained hibiscus plus rosehip, doubling the red power and vitamin C content. The chai tea adds the spice. Place the tea bags in a heatproof pitcher or jar. Add the ginger and strip of orange zest. Pour over the boiling water. Cover and let the tea steep 30 minutes. Add sugar or sweetener to taste. Let the mixture steep until completely cool. Strain the liquid, discarding tea bags, ginger and zest. Chill the infusion. 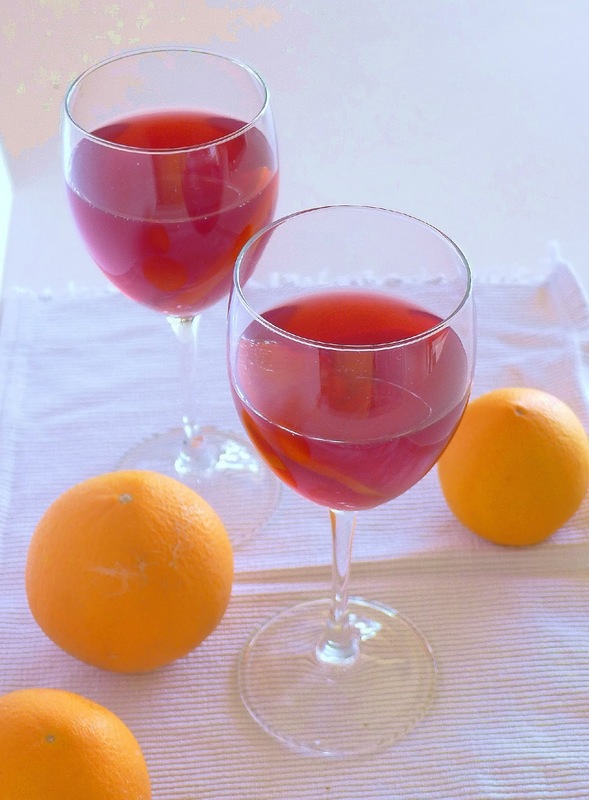 Divide the infusion between glasses or goblets, adding ice, if desired. Add seltzer and orange slices to the drinks. Leftover hibiscus punch is starter for sauce. Scoring the layer of fat allows the fat to render out in cooking. Moderate heat so it doesn't splatter and, carefully, drain off the fat part way through cooking. Anything sautéed in the reserved duck fat will be delicious. Here I've used par-boiled potatoes and Brussels sprouts. Place 1 cup of the hibiscus drink in a saucepan with the Sherry. Bring to a boil, reduce heat and let it bubble 5 minutes until alcohol is cooked off and liquid is slightly reduced. Place remaining ¼ cup of the hibiscus drink in a small bowl. Add the cornstarch and stir until smooth. Whisk the cornstarch mixture into the sauce. Cook, stirring, until sauce is thickened. 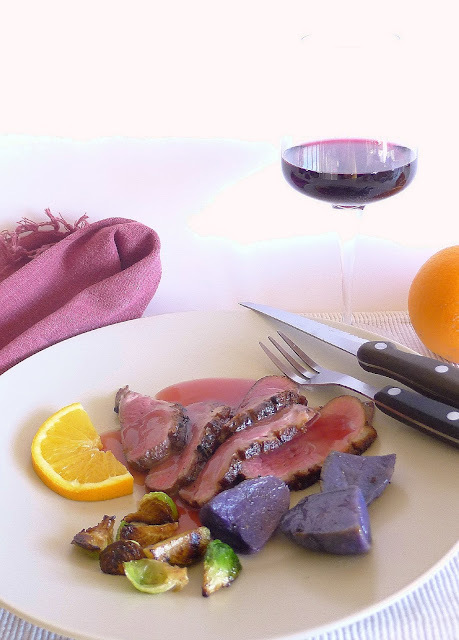 Keep sauce warm while preparing the duck breasts. 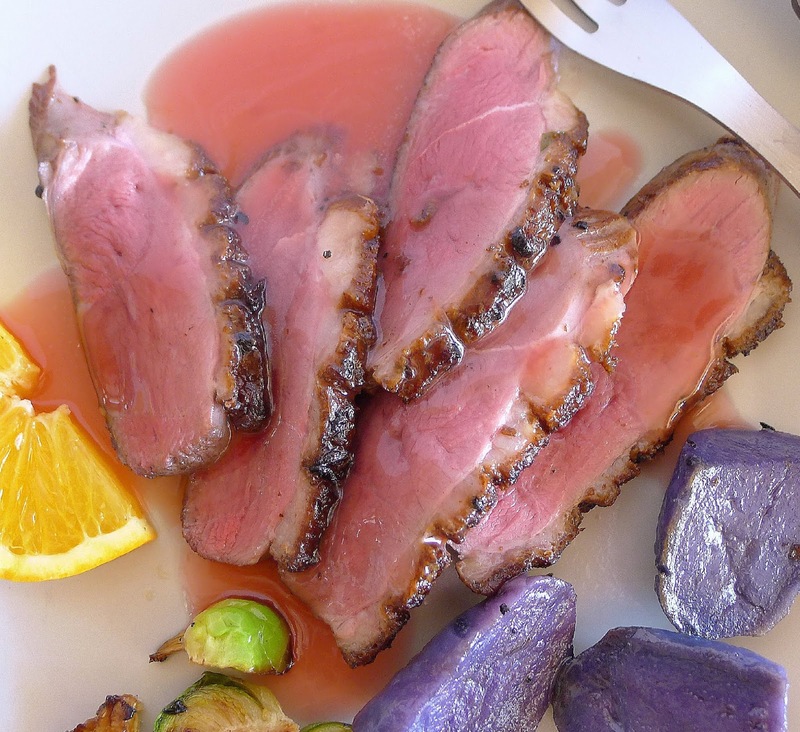 Place the duck breasts on a cutting board, fat-side up. With a sharp knife, score the fat without cutting into the flesh. Sprinkle generously with salt and pepper. Sprinkle the crushed allspice on the top of each, rubbing it into the cuts. Scoring the layer of fat allows the fat to render during cooking. Place the breasts on a cutting board. Allow them to rest 5 minutes, then slice about ¼ inch thick. 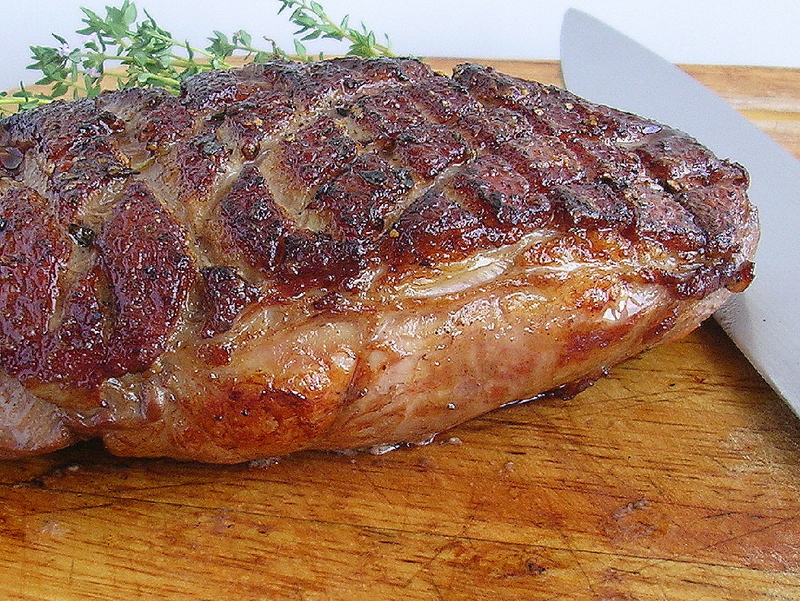 Plate the sliced duck. Spoon over the sauce and garnish the plates with sliced oranges. Fig and PX Wine Sauce. HAPPY TWELFTH NIGHT OF CHRISTMAS!